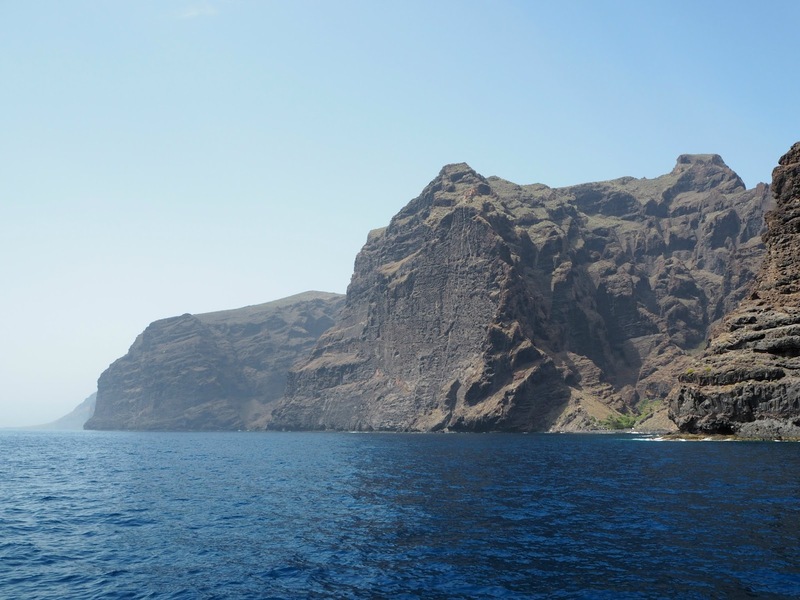 Following up on my Tenerife Holiday Part 1, My second day trip during my Tenerife holiday, was a 5h boat trip to the Los Gigantos rocks at the very southwest end of the island and later, to swim out to the Atlantic Ocean to hopefully spot dolphins. I booked the trip with a company called "Royal Dolphin" through my hotel and it turned out to be a bit of a tourist trap. There was no time given when the boat would leave from Puerto Colon (which was literally a 10minute walk away from my hotel, but I didn't know at the time), so at first I was trapped on a 45minute bus trip to collect other tourists. By the time the bus arrived in Puerto Colon, three buses had already arrived and there were literally 100 people cramped on that catamaran boat, all sundeck seats were taken. Slightly annoyed, I took a seat under deck and it turned out to be the better place then upstairs. The waves were insane! The boat was rocking a lot....like a toy, the waves would just play with it. You can imagine that many people got seasick and came to the lower deck throwing up or just lying in the corner struggling with themselves. Surprisingly, I was fine :) The first stop after 2h was the impressive Los Gigantos, a rock face in the southwest of the island with a beautiful, calm cove where our boat came to a halt and people who fancied a swim were allowed to do so. I went to the glass bottom and watched small fish in the crystal clear deep blue sea. After a 1h stop for swimming and lunch, the boat took us out to the Atlantic Ocean in the hope to see wild dolphins and whales. I know they live quite far outside in the sea so I was wondering how far they would actually take us. 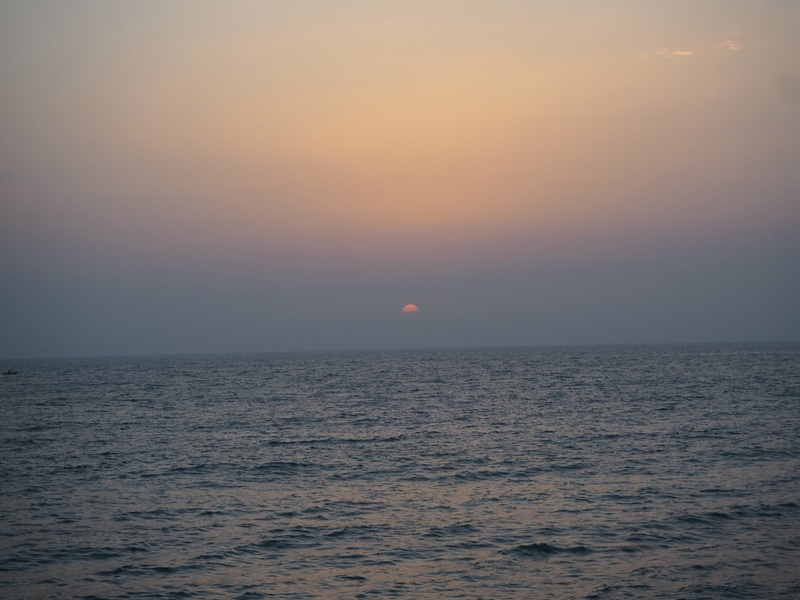 I secured a spot at the very bow of the catamaran and enjoyed the warm Canary Island sun burning from a cloudless sky. It was a fantastic day out on the sea. Blue waves, seagulls flew with the boat, the warm wind softly played with my hair and now and again sea water would spray over my warm skin which felt refreshing. I could have been on the boat forever. After 1h or so, people became nervous and really rude. They would squeeze and push and not take care of others at all. Note to myself: stay away from tourist traps next time. A few times I got worried about my own safety a bit, as the waves would lift the boat high up and the downfall of the boat would smash the bow of the ship to the water surface with sometimes only half a meter away. There was simply nothing to be seen in the water. But then another tourist boat came nearer to us and close to their bow two common dolphins jumped out of the sea. It was a great moment! At first, I thought this is probably all I'll ever going to see. 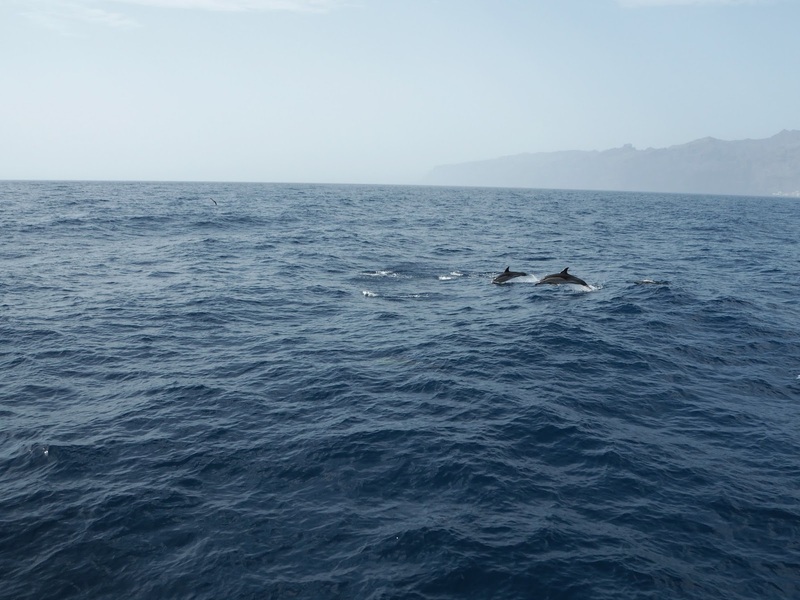 Those two amazing tri-coloured, 2m big dolphins a good 60 meters away, but then a group of 12 common dolphins came out of nowhere, suddenly surrounding our boat. They swam alongside the boat for at least 20 minutes. They were so close and as I said, the waves were still high and with the boat coming to a downfall, I could have literally just put my hand out there and touched them. It was dangerous though! I had to hold on to the rail with one hand and with the other I tried to get balance and take some pictures. I also had to watch out for people who were more ruthless since the dolphins were so close. It was a magical moment! They would jump in front of the boat and you could hear them breathe when they came to the surface. They were super fast and changed directions within milliseconds. Just to see them in their natural habitat was a moment of a lifetime. Sorry for the corny expressions but I don't know how to better describe the experience. 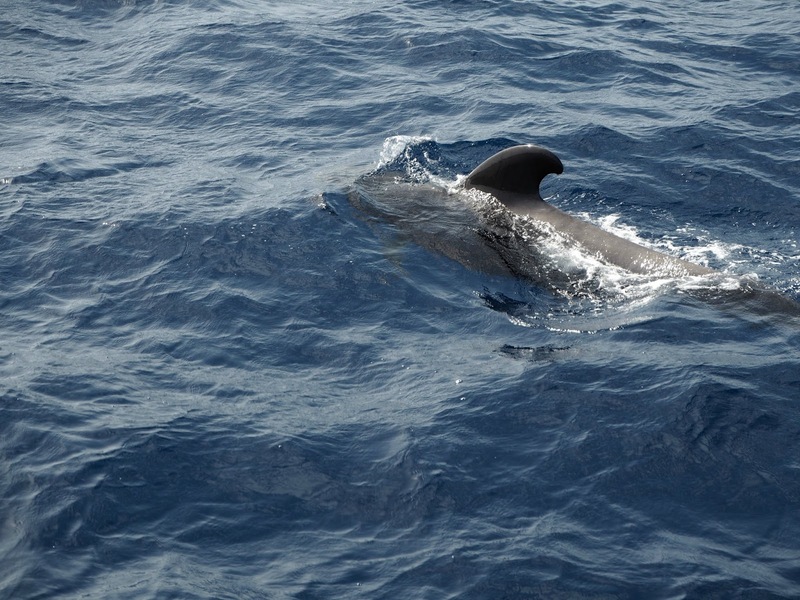 Soon after, a small family of pilot whales turned up in between the wide blue landscape of waves. 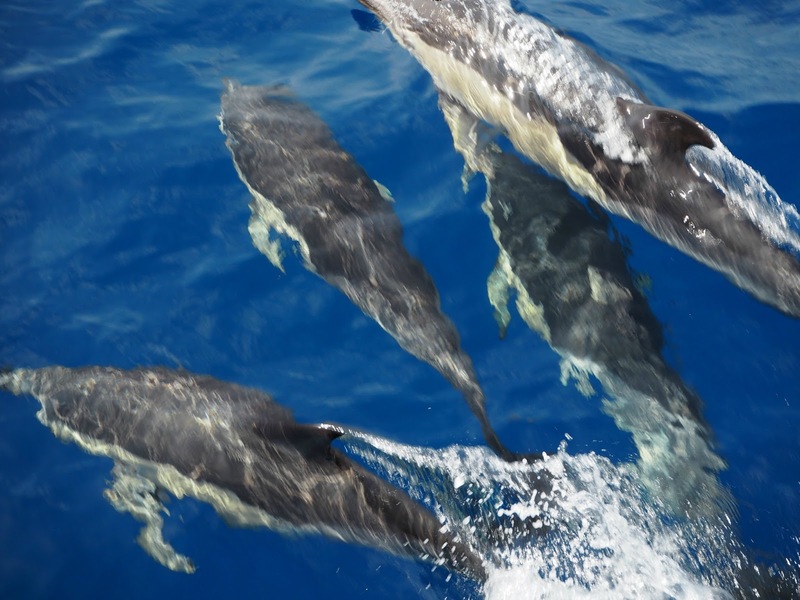 They were a lot bigger than the agile common dolphins, moving very slowly and gracefully through the water. You could see their shadows in the water and tell when they would come back to the surface to breathe. They were so peaceful and beautiful to watch, I wish I had more time to observe them. The boat stopped and floated in the water so that I could see the whales slowly swimming further away into the open ocean. On the way back to Puerto Colon I didn't see any more dolphins, but as I said, they live far outside and it would be a surprise if they would be close to the shores. After a long day out at the sea, I walked back to the hotel and prepared for dinner at the Hard Rock Cafe in Los Cristianos. 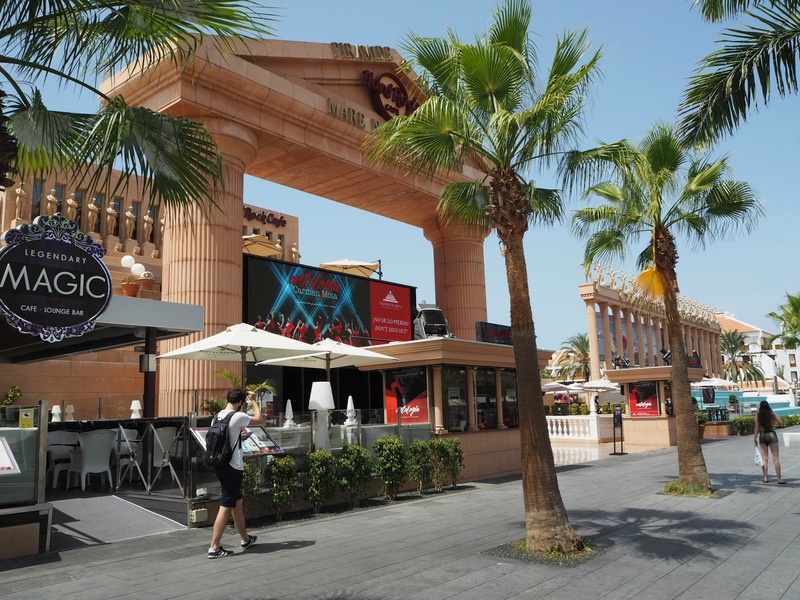 I've never been to a Hard Rock Cafe before, but this one was a centrepiece of the promenade. The building reminded me of the Dolby Theatre in L.A. Food was ok, mainly burger, pasta and typical standard British cuisine. The atmosphere was interesting as the staff would dance on the tables and bar as soon as "We will rock you" came on. 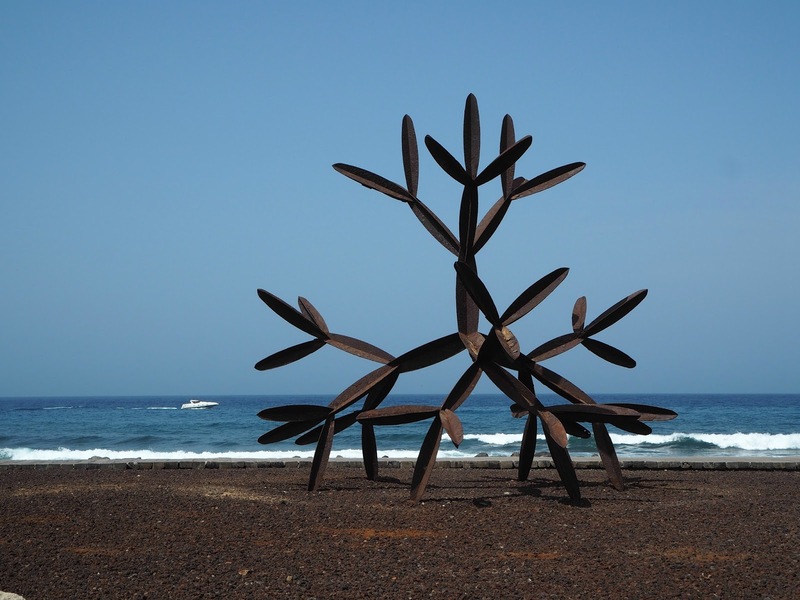 The meal was followed by a stroll along the beach promenade back to the hotel, passed these metal sculptures which decorate the beaches in Los Cristianos. They look bizarre and sadly, I couldn't find out much about them, bar that the artist is J.A. Salvador. This arty influence and a touch of surrealism are very typical for Spain and I love how the art is brought closer to you. Think Gaudi houses in Barcelona or the floating shapes of the eggs and clocks from Salvador Dali. 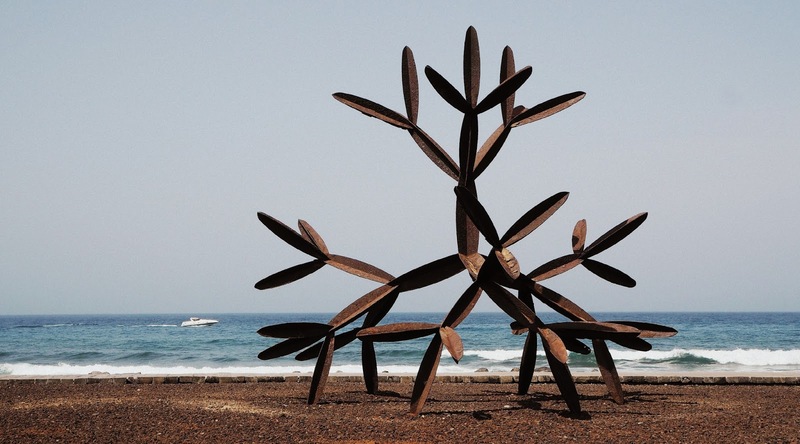 Spain's art history is so rich and interesting and to be found in every corner, even at the beach. So yeah, now you know what I've been up to on my holiday and what a great place Tenerife is. I would love to go there again, but then I would get bored pretty quickly. One week was a good amount of time to relax and refuel on energies and I'm interested in going back to Grand Canaria one day, to see the impressive dunes of Maspalomas again. Overall, the Canary Islands are great if you crave sun like me and want guaranteed heat and a refreshing ocean to swim in. The offer on water sports is amazing and it is very touristy in certain areas, hence why those areas are pricey. 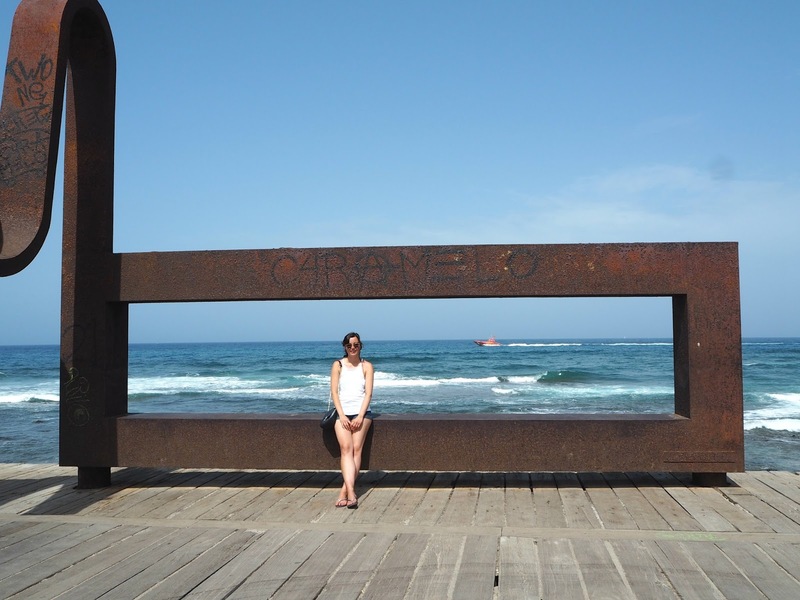 If you're after culture and much sightseeing, then I think the Canary Islands will be a bit disappointing, unless you can commit yourself to renting a car and driving around (which I said in my first post was not an option for me, you know holiday time is relaxing time). 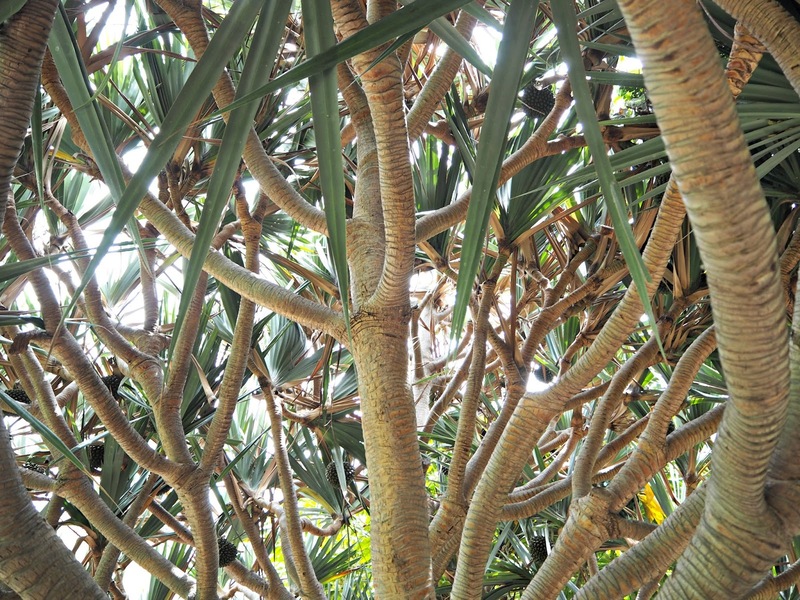 The islands are sometimes referred to as "miniature continents" as you have a huge variety of vegetation and changing flora and fauna in such a small, condensed space. Again, if you're interested in that and you can commit yourself to driving, you will have a great time exploring the islands. When you have a 10h commute weekly on the London tube, you're constantly surrounded by people, and you're depressed from the never-ending rain and dreary weather, then the Canary Islands will welcome you with sun, heat, sandy lava beaches, spotless and empty polished shopping malls and incredible food to refuel on energies. Thank you very much for checking out today's post. 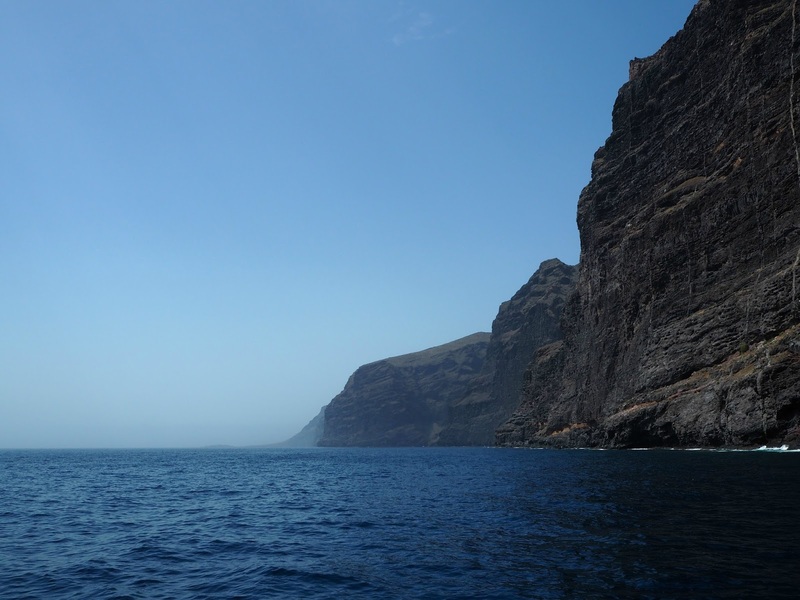 Would the Canary islands be of interest to you? Where have you been on summer holidays this year? Let me know, I've got three weeks of annual leave left over so I'm planning on another trip soon and I haven't got plans yet for a destination.